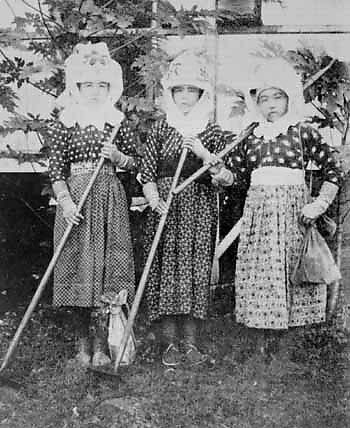 Issei women from Fukushima prefecture, at Kawailoa Sugar Plantation, Oahu, Hawaii, 1906. Three women dressed in plantation field worker attire with head covering to protect them form dust and heat. Each holds a long stick in her hand. The one on the R is holding the stick over her shoulder. editor — Atualizado em Mar 30 2011 7:50 p.m.